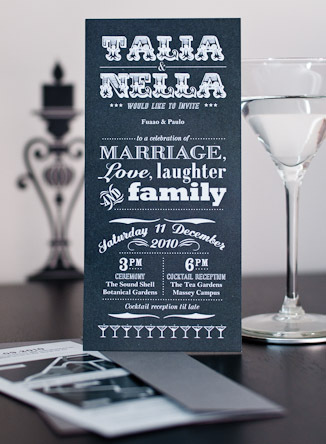 A cocktail wedding reception needs a stylish invitation – and that’s just what Nella and Talia got. 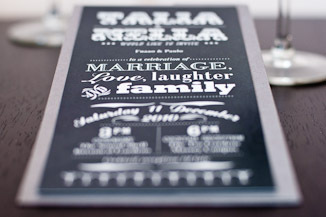 They were rapt with the invitation, that has now set the theme for their wedding. If you would like us to personalise your wedding style or kick start your theme with custom designed stationery, drop Aneta an email. 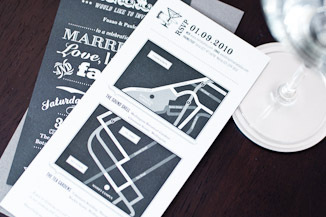 Aneta did a fantastic job with our invitation. We’ve received a lot of compliments so far. We definitely got our money’s worth. Thanks Aneta! You’re the bomb.